The 2013 and 2017 Commonwealth champion, Pooja, who had beaten Helen in the league stage too, repeated her feat in the sixth bout of the day that sealed Haryana Hammers' fate. India's Pooja Dhanda stole the show as she upset World and Olympic Champion Helen Maroulis to set up Punjab Royals' second straight title triumph at the Pro Wrestling League on Friday. The 2013 and 2017 Commonwealth champion, Pooja, who had beaten Helen in the league stage too, repeated her feat in the sixth bout of the day that sealed Haryana Hammers' fate. World Championship gold medallist Zurabi Iakobishvili showed his class in the next clash, to win 4-0 and clinch the championship for Punjab Royals 5-2 in front of a packed house. Earlier, Anastasija Grigorjeva and Koumba Laroque had won two fights for the Royals while Vladimir Khinchegashvili and Khetik Tsabolov the other two for the Hammers to lock the nine-bout tie at 2-2 after four clashes. "This is the best gift I could give to my country on Republic Day," Pooja said, shortly after her sensational victory. "Saare jahan se acha Hindustan hamaara," she added. 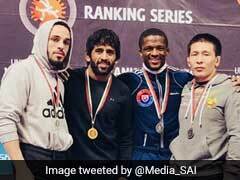 Reigning Olympic champion Vladimir got the Hammers off to a winning start, scoring a comprehensive 4-0 victory over India's Naveen Kumar in the 57-kg competition. Georgia's Vladimir lived up to his reputation, dominating the opening period and racing to a healthy 4-0 lead straightaway. After the breather, he used all his skills and strength to ward off the Indian and comfortably defend his lead to put his team ahead in the nine-bout duel. The Royals drew level in the second bout, through 2017 World Championship bronze medalist Anastasija Grigorjeva. 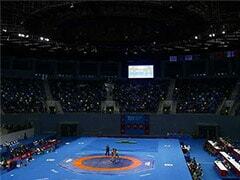 In an intense fight, she steamrolled India's Sarita Mor 7-2 in the 62-kg women's contest. Anastasija took an early 1-0 lead but Sarita jumped ahead to 2-1 with a smart move. But Anastasija fought back to make it 2-2 by the break. She was on song thereafter, taking a 5-2 lead and wrapping up the bout 7-2. The Hammers' slipped into a 2-1 lead, with Khetik Tsabolov, the 2017 World Championship runner-up, taking down India's Jitender Kinha 15-0 by technical superiority in the 74-kg competition. In the opening period, Khetik spent majority of the opening period getting a measure of Jitender and taking a slender 2-0 lead. In the second round, the Russian was at his ruthless best, blitzing his way to victory without breaking into sweat. France's Koumba then beat Pooja Sihag 7-0 to level the tie. In the battle of super heavyweights, Punjab's icon player Geno Petriashvili wrestled with élan to send his side 3-2 up. The World Champion started off slowly but soon got into his groove to thrash India's Sumit Malik 15-0. Geno cruised to a 11-0 lead in the opening round and comfortably won the bout. He has remained unbeaten through the entire league. In the most-awaited clash, Pooja began on the back foot, losing the initial point to favourite Helen. She didn't give up the fight though, giving it her all to take a slender 2-1 lead. Pooja continued her glorious run in the tournament after she beat current World and Olympic champion Helen Maroulis 3-2 in a thrilling encounter. The US wrestler began well leading 1-0 in the opening period. She defended well in the second period and it looked like she would avenge her loss but the Indian showed great resiliency to win the humdinger of a clash.